Saori’s ace G Unit finally is revealed, along with a new specialty G Guardian for Kagero! ACT (VC) 1/Turn: [Soul Blast 1 & Choose 1 face-down Unit with the same name as this Unit, flip it face-up] Choose 1 of your opponent’s Rear-guards, Retire it. 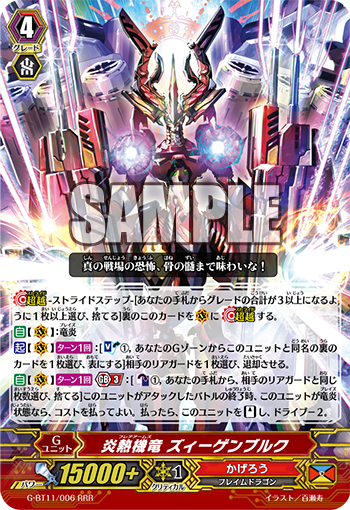 AUTO (VC) 1/Turn GB3: [Counter Blast 1 & Choose a number of cards from your hand equal to the number of your opponent’s Rear-guards, Discard them] When a battle in which this Unit attacks ends, if this Unit is Blazing, you can pay the Cost. If you pay it, [Stand] this Unit, but it loses Drive-2. AUTO: [Counter Blast 1] During a battle in which your Vanguard is attacked by your opponent’s Vanguard, when this Unit is placed on (GC), you can pay the cost. For each of your opponent’s (RC) without a Unit, during that battle, this Unit gains Power+10000. For Today’s Card, we’re introducing the following cards from the 11th Booster Pack “Demonic Advent” (on sale June 9th, 2017)! “Flare Arms, Ziegenburg” is a G Unit, that under the right conditions, can Stand without using up a card from your hand. First, by using 1 Soul Blast, you can Retire 1 of your opponent’s Rear-guards! And if you combine this with “Dragonic Blademaster “Kouen””, you can Retire a total of 2 of your opponent’s Rear-guards. Also, at the end of a battle in which it attacks, it can Stand itself as long as it is 【Blazing】! The cost of doing so requires you to use up your hand, a number of cards in your hand equal to the number of your opponent’s Rear-guards, so if your oppponent has no Rear-guards, it can Stand without discarding a single card! Aim to use this Stand ability by combining it in tandem with 《Kagero》’s Retire abilities. And, “Divine Dragon Knight, Abdus Salam” is a G Guardian that specializes in protecting the Vanguard. When your Vanguard is attacked by your opponent’s Rear-guard, for each of your opponent’s Rear-guard Circles that don’t have an opponent Unit occupying them, it gains Shield+10000! If your opponent has no Rear-guards, it gains a total of +50000, meaning it becomes a 65000 Shield Guard. Use it in tandem with G Guardians that can use Retire abilities during the opponent’s turn, such as “Flame Wing Steel Beast, Denial Griffin” or “Supreme Heavenly Emperor Dragon, Advance Guard Dragon”!